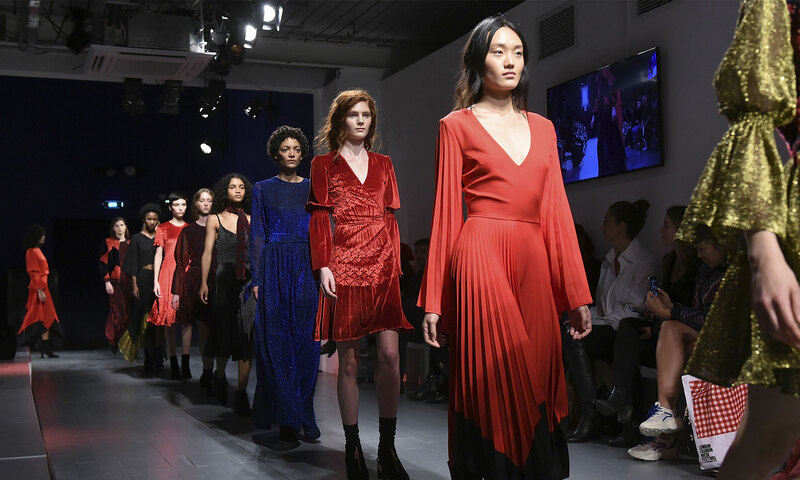 This February, London Fashion Week returns to showcase some of the most creative and innovative fashion designers in the world and ignites a city-wide celebration of the creative industries. London Fashion Week celebrates the intersection of fashion, music, art, design and tech with London, one of the most multicultural, vibrant and diverse cities, as a backdrop. London Fashion Week encourages designer businesses, global brands and creative institutions to celebrate and encourage the public to get involved and celebrate the creative industries. From exhibitions to in-store activation, digital engagement and events throughout the month of February, all the below activities and events are open to the public. London Fashion Week Festival presents London Fashion Week: Insiders jam-packed schedule will take place over two days during LFW on the 16th and 17th of February at The Store X, 180 Strand. There will be see-now, buy-now catwalk shows, industry talks, retail space and consumer experiences. The BFC are delighted to be working with BBC Earth and ‘No Frills’ sustainable fashion designer Amy Powney of Mother of Pearl in a partnership to discuss Positive Fashion. In the first event of its kind, this collaboration brings together the global reach of the BBC, the pioneering sustainability strategy of Mother of Pearl and the fashion influence of the BFC to host a talk series on Saturday the 16th of February. The focus of the talks will be centred on the impact the fashion industry has on the planet while highlighting the positive tangible opportunity for sustainable fashion choices and mindful consumer behaviour. The event will be filmed by BBC Earth and content will be published across digital and social platforms ensuring global consumer reach across the BBC and BFC communities. Speakers will be announced in the coming weeks. The two-day runway preview will see SS19 collections on Sunday from Fyodor Golan who will present their Lost & Found collection which mixes sporty, surfer details with soft silks and embroidery while also delving into the past with influences from SEGA’s Sonic the Hedgehog used to create your favourite childhood pyjamas contemporarily reimagined. OSMAN refines his signature cuts and silhouettes with new colours and textures, playing with exuberant layers of ruffles and draping of fabrics on the body, as always, he will showcase cuts that flatter the female form and make a woman feel powerful. A further two designer catwalks for Saturday will be announced in the coming weeks. The talks schedule for Sunday will be led by fashion industry insiders and full schedule will be announced in the coming weeks. Ticket: Insider (£135) and Front Row (£245). The International Fashion Showcase (IFS) nurtures and presents work from the most exciting fashion talent from around the world. Working in partnership, the British Council, British Fashion Council, London College of Fashion and Somerset House provide a tailored programme for 16 emerging international designers from 16 countries around the world, including a business development programme lead by London College of Fashion and a creative residency within Somerset House Studios in London. IFS will culminate with a free public exhibition during London Fashion Week at Somerset House, entitled ‘Brave New Worlds’ and showcasing the work developed by the designers in a compelling series of installations exploring urgent issues and new ideas that are shaping fashion globally. For more information please click here. Homeware emporium Anthropologie has launched their latest exhibition at the Kings Road Gallery. A collaboration with Artfully Walls (a curated online shopping destination), the exhibition aims to connect quality, affordable pieces with art lovers. The portfolio of artists has been handpicked by the Anthropologie team: all prints sold are museum quality fine-art prints made with archival inks and premium paper, canvas, resulting in vivid and stunning pieces. Artists on show include Charlotte Ager, Charlotte Taylor, Francesca Iannaccone, Laura Gee and Rosie Harbottle. For more information please click here. Another_Space are hosting a post London Fashion Week themed cycle class. Follow @another_spacelondon to book a bike. For more information please click here. Dubbed the “Weave Project,” the four-day event will centre around an art installation — a giant and interactive neon-blue, hand-netted tube housed in the top floor of Brewer Street Car Park in London’s Soho — created by artist collective Numen/For Use to coincide with the global relaunch of the woven Neeson bag for Spring/Summer 2019. In addition to the installation, there will also be a themed Weave Project café and a pop-up shop stocking the Neeson collection and special edition merch, while bags can be personalised on-site by crafts people who specialise in weaving. Tickets available here. 15 exquisite drawings by Italian Renaissance master Michelangelo are shown alongside video installations by contemporary artist Bill Viola in a major Royal Academy exhibition. Juxtaposing Viola and his ancient forebear, for the first time, The Royal Academy explores the unexpected affinities between the two artists. For more information please click here. The event ‘Celebrating China’ includes a pop-up boutique curated by fashion influencer Susie Bubble which includes a slew of rising stars, allowing consumers to shop alternative brands including Ryan Lo, Mukzin, I Am Chen, Marie Yat, Xu Zhi and Matter Matter. For more information please click here. Spanning 1947 to the present day, this exhibition will trace the history and impact of one of the 20th century’s most influential couturiers, exploring the enduring influence of the fashion house, and Dior’s relationship with Britain. More information and ticket purchase available here. Whoever you’re celebrating with, join us at The Fount Bar to enjoy an exclusive Rose Champagne tasting with Moët & Chandon brand ambassador, Marion Baudet and Ethan Boroian, UK Champagne Ambassador. Plus, enjoy a delicious food pairing board, designed to accompany your Moët & Chandon Rosé Impérial. You’ll be schooled in the art of bubbly and be presented with a personalised mini bottle of Moët to take away. We’ll toast to that. More information and ticket purchase available here. Gagosian is pleased to present selected photographs by David Bailey. Bailey’s bold and iconoclastic style has made him one of the world’s most renowned living portrait photographers, and earned him as much fame as his stellar subjects. Discarding the rigid rules of a previous generation of portrait and fashion photographers, he channelled and immortalised the energies of London in the 1960s and beyond. For more information please click here. To celebrate the success of the Diana: Her Fashion Story exhibition, outfits from some of Diana’s most iconic moments have been added to the display for 2018. In this elegant exhibition at Diana’s former London home, her relationship with her favourite designers will be explored through a display of some of their original fashion sketches, created for her during the design process. For more information please click here. Diane Arbus was a genius. She was an early mover and shaker in the world of photography whose ripples can still be seen fifty years after her death. In 2019, The Hayward Gallery showcases her earliest work from a prolific but fledgling period, from 1956-1962. Tickets available for purchase here. Liberty London is excited to announce the launch of an exclusive pop-up with British fashion brand Fyodor Golan. Known for their vibrant colours, tech fabrics and sportswear aesthetics, the brand will recreate their Spring/Summer 19 runway set design in womenswear on Level 1.
embellished with castaway elements; from seashells to pearls and plastic waste. To add iconic nostalgia, the duo collaborated with SEGA’s ‘Sonic the Hedgehog’, focusing on early pixelated imagery that showcased raw silks in bold fuchsia, and cyan blue tones. For more information please see click here. Grace Wales Bonner presents the first in a new series of unique projects in the fields of music, fashion, art and design Featuring Chino Amobi, Black Audio Film Collective, David Hammons, Rotimi Fani Kayode, Michael-John Harper, Liz Johnson Artur, Rashid Johnson, Kapwani Kiwanga, Klein, Laraaji, Eric N. Mack, Paul Mpagi Sepuya, Ben Okri, Ishmael Reed, Sahel Sound. This exhibition focuses on Wales Bonner’s rigorous research into multiple geographies and temporalities, culminating in the presentation of her forthcoming Autumn/Winter 2019 collection, Mumbo Jumbo, a title taken from writer and exhibition booklet contributor Ishmael Reed’s seminal text of 1972. Conjuring and exploring various characters, their dress, and the worlds and spaces they inhabit, the collection features certain protagonists, such as the artist-shaman, a West African spiritual healer, and a gathering of Howard University intellectuals. At its close, the exhibition becomes an environment for the characters to inhabit. For more information please click here. Koibird is an innovative concept store born out of the desire to capture the exoticism of travel in a retail experience. The brainchild of Belma Gaudio, Koibird is designed by set designer Anna Burns. New for this season the store covers all facets of Alpine dressing, cold weather essentials, ski-wear, clothing, footwear and accessories from brands including Lingua Franca, Natasha Zinko and Perfect Moment with exclusive designs and one-off pieces available in-store. For more information please click here. The London Jewellery Showroom is back on Bond Street for 2019 to bring you two days of the best designer jewellery during LFW. A chance to discover and buy exclusive new fine and demi fine jewellery pieces from international contemporary jewellery brands such as Sian Evans, Sarah Zhuang and Dainty London. Also discover the secrets of the jewellery industry with a range of insightful industry talks including ‘How to launch your own jewellery brand’, ‘A beginners guide to gemmology’ and ‘Jewels that catch an expert’s eye’ with Joanna Hardy. For more information please click here. To celebrate the SS19 instalment of MATCHESFASHION.COM’S The Innovators, join our three pioneering new designers – Harris Reed, Marta Ferri and John-Paul Pietrus of Francis de Lara – for an evening of cocktails, and be among the first to shop the pieces, exclusive to MATCHESFASHION.COM. For more information please click here. Iconic underwear brand sloggi are launching at Boxpark Shoreditch on the 8th February. The Boxpark pop-up will be their first UK retail store, a landmark opening for the best-selling brief brand. Their six-month pop-up at Boxpark Shoreditch will tell their story and show off their full product range including S by sloggi which is their premium line and the official lingerie supplier of LFW. For more information please click here. The art on show is not only available for browsing. An eclectic range of pieces including a new series of Kusama’s now iconic pumpkin, Carsten Höller’s enigmatic animals and an exclusive neon piece by Douglas Gordon are available for purchase from the Art Store, housed in London’s Corner Shop. The space combines retail, customer interaction and artist participation and will also feature major installations by Tyrrell Winston, John Margaritis, and Paola Pivi’s fluorescent feathered Polar Bears. For more information please click here. Swinging London: A Lifestyle Revolution will present the fashion, design and art of the Chelsea Set; a group of radical young architects, designers, photographers and artists who were redefining the concept of youth and challenging the established order in 1950s London. At the forefront of this group of young revolutionaries were Mary Quant and Terence Conran. For more information please click here. Proud Galleries is pleased to present The Dior Collection, an exhibition of fashion photography showcasing the legendary designs of Christian Dior and its enduring impact on the fashion world. The House of Dior is renowned for revitalising both haute couture and ready-to-wear fashion in the 20th Century and its legacy continues to inspire modern style. Documenting this remarkable brand throughout its first two decades, the exhibition displays the iconic works of Mark Shaw, Norman Parkinson, Jerry Schatzberg, Bert Stern and Horst P. Horst. From the polished editorial shots capturing well-known figures for Life magazine, to behind-the-scenes studio snapshots, The Dior Collection explores the creation of this revolutionary luxury brand and its reinvention of the female silhouette. Entry for the exhibition is free and is open daily Monday to Saturday, 10am till 7pm and on Sundays from 10am till 6pm. For more information please click here. Over two days, The Jewellery Cut Live – which is being run in partnership with Push PR – will give shoppers, retail buyers and press the chance to meet jewellery designers, place orders, browse and buy jewellery. The designers on show will offer visitors a mix of styles, from trend-led silver jewels to bespoke fine jewellery, and are a mix of international brands, global players and emerging talent. There will also be a series of talks held during the two days from prominent players in the industry, including influencers Katerina Perez, Kelly Seymour of Cult of Youth and Beanie Major of InDetail. Sessions will also be led by The Telegraph jewellery and watches editor Sarah Royce-Greensill, The Jewellery Cut editorial director Rachael Taylor and Push PR founder Emma Hart. The Jewellery Cut Live will be open from 10am -9pm on Monday, 18th February and 10am – 6pm on Tuesday, 19th February. There will be complementary refreshments offered to all guests throughout the days, including an after-work shopping event from 6pm to 9pm on the 18th, with free drinks for shoppers. There will also be a piercer and manicurist at the event, offering complementary treatments for guests throughout the days. Tickets to attend The Jewellery Cut Live are free, but guests must register on Eventbrite here. In honour of the V&A’s remarkable ‘Christian Dior: Designer of Dreams’ exhibition, the May Fair will present a bespoke range of Dior-inspired cocktails. Fashion and cocktail lovers are invited to taste ‘The Dior Collection,’ based on the exhibition’s most celebrated dresses. After immersing yourself in one of the 20th century’s most influential couturiers, experience the delightful ‘Écarlate’, ‘Pérou’ and ‘Soirée de décember’ in the Official Hotel of London Fashion Week. Cocktails are priced at £16 and The Dior Collection Flight at £45. For more information please click here. The generosity and commitment of our sponsors, suppliers and supporters is more vital than ever. Please help us by acknowledging their support for London Fashion Week September 2018: Official Sponsors Code 8, Evening Standard, JD.com, Inc., Lavazza, The May Fair Hotel, Mercedes-Benz, Nivea, The Store X, TONI&GUY; Official Suppliers Bags of Ethics, DHL, evian, Fashion & Beauty Monitor, The Gel Bottle, Getty Images, Lärabar, Launchmetrics, Peroni Nastro Azzurro, PROPERCORN, Propress, Scavi & Ray Prosecco, S by Sloggi; Official Supporters: The Department for International Trade, The European Regional Development Fund and The Mayor of London. Move over tea & coffee - Brits prefer prosecco with their biscuits!